The project is conceptualised in three distinct forms of realization, such as two performances – Solo and Group Version – and the Performance Recipe Book. The development of all formats is interconnected with a running process of each other, in order to make a documentary as well as a creative note simultaneously. It is made intentionally, so that Akemi Takeya proves and explores her artistic development until now. 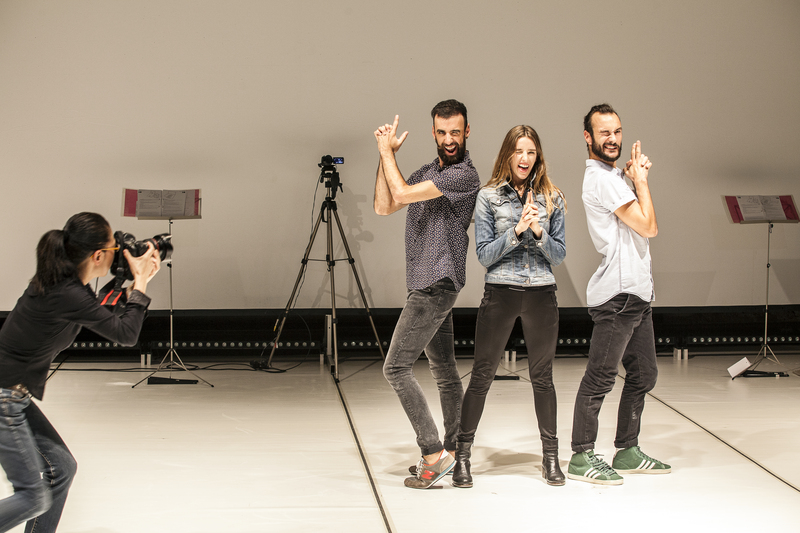 She will now complete the project with a new creation of the Group Version with 4 performers in Austria in summer 2015, developed in connection with the Performance Recipe Book Vol. 2. The Performance Recipe Book – Vol.1 (the first part) is written for both Group and Solo Version, as a creative documentary note as well as an educational resource. It sets the performer(s) the task to take up the challenge of realizing 32 interpretations out of these “Performance Recipes,” which focus on accessing and sharing the experience either with the book through practicing the recipes or by performing in front of an audience. The recipes in this book are easy to learn in a short period. One can also simply enjoy seeing patterns of physical interpretation, just like a game. * Vol. 2 (the second part) is planned to be published in connection to the development of the Group Version and its premiere in 2015. Vol. 1 contains 90 pages and was published in 2014 by IMEKAproduction in coproduction with ImPulsTanz – Vienna International Dance Festival. The book was completed for both Solo and Group Version, while working on the solo performance and the research project including the workshop at ImPulsTanz 2014. 1) The First Part: “32 interpretations of the original S.O.S.” – a performance exhibition that features body as a symbolic model in a medley. 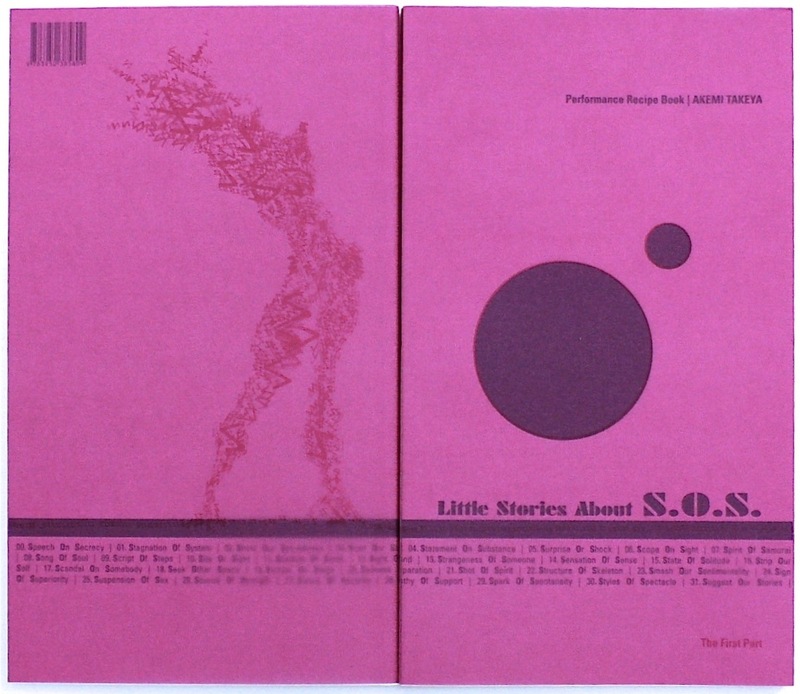 In a symbolic order, the piece suggests “emergency” in a limited time frame and in various forms of irony, and describes certain cases of “situated action”, featuring 32 interpretations of the original combinations of S.O.S. as a performance vocabulary. Each of the humorous scenes succeeding each other is coupled with a short graphic animation film by Road Izumiyama (J), which is projected onto the stage before the respective live act. 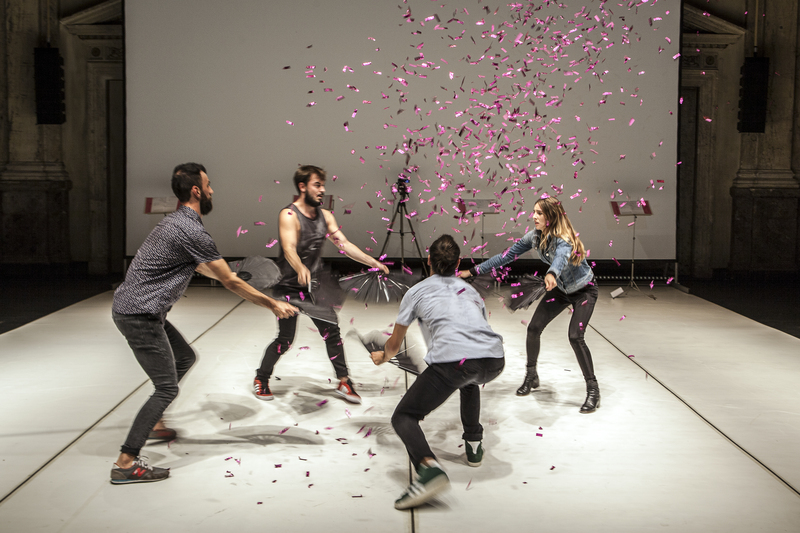 Interpreted by the performers as bodily motions they juxtapose with the graphic motion on screen. This process runs parallel with the written Performance Recipe Book Vol. 1 which contains performance instructions. Each performance recipe listed is interpreted by a performer one after the other as a medley of performance language, (re-)forming the body in everyday human activities. Irrelevant in everyday human activity, these symbolic systems addressed become central and are implemented as a concurrency model to give another view of the performance. 2) The second Part: “a progressed plot (short story) based on the first part” – a voyage that transforms the 32 elements into a body to be negotiated in connection with various situational aspects of crime. It is designed as playful and poetic game – a voyage which transforms the 32 elements into a body to be negotiated, in connection with various situational aspects of crime and from the viewpoint of a “dry” spirit of criticism watching human existence. 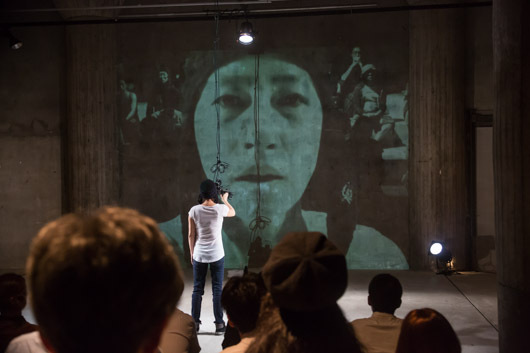 During the live performance, the materials produced by using live video & photo cameras on the stage in order to document the actions with pictures are projected on screen – revealing the manipulation of documentary systems: that which just occurred is still present, while in the next moment it becomes documented as a past event. The progress of the second part runs parallel with the written Performance Recipe Book Vol. 2 which contains a theatrical plot and instructions for each scene – integrating the 32 elements of the first part fragmentarily, metaphorically. The creation of the Group Version Vol. 1 has started with the new concept of JCDN’s “A dance regional support program B” with 3 Japanese male performers in February 2011. The premiere was featured at Izumu Hall, Fukuoka (Jp) on 26.02.2011, and the further performances was presented at Ai Hall, Itami (Jp) on 03. & 04.03.2011. * Co produced by JCDN / Co sponsored by Fukuoka foundation of Art & culture / Supported by The City of Vienna, Cultural Bureau, Austrian Federal Ministry for Education, the Arts & Culture and Austrian Culture Forum Tokyo. The Solo Version is the interpretation of the first part only. 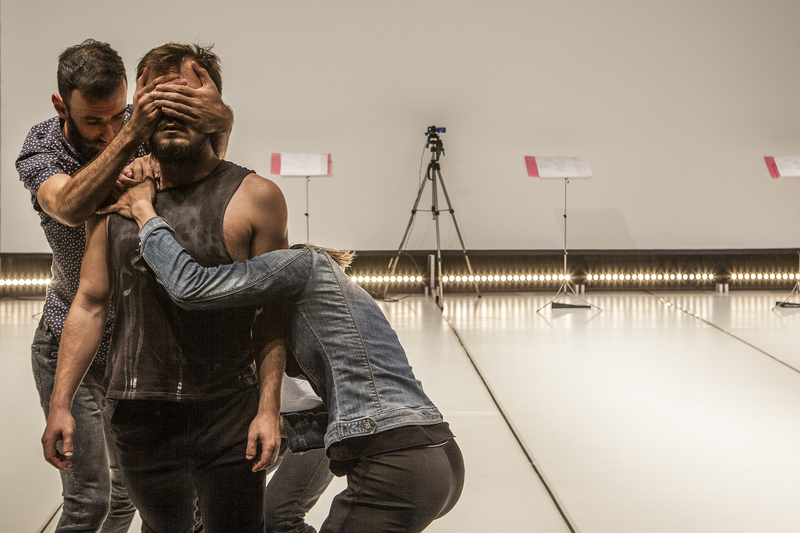 The “32 interpretations of the original S.O.S.” are performed by a single person, revealing his / her body as a symbolic model – It is an emergency call. Akemi Takeya is sending out an S.O.S. 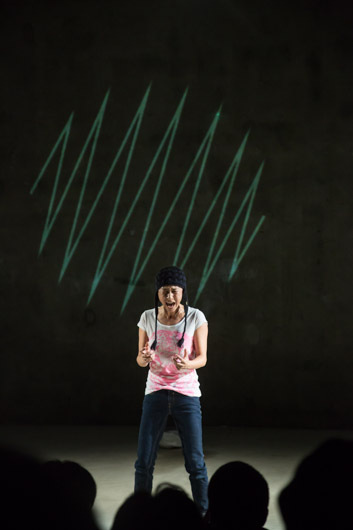 In the medley-interpretation of 32 short stories the Japanese born Viennese choreographer welcomes us in her original, creative world mushrooming at the threshold between Asia and Europe.